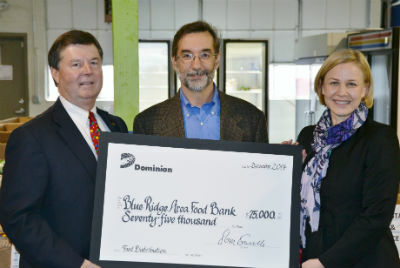 The Blue Ridge Area Food Bank has received a $75,000 donation from the Dominion Foundation, the philanthropic arm of Dominion Resources, Inc., parent company of Dominion Virginia Power. A gift of this size will allow the Food Bank to provide 300,000 meals, enough to feed more than 3,000 hungry neighbors for one month. A check presentation event took place on Tuesday, Dec. 23 at 11 a.m. at the BRAFB’s Charlottesville distribution center, located at 1207 Harris Street. Michael McKee, CEO of the Blue Ridge Area Food Bank, accepted the contribution from Susan King, Dominion External Affairs Representative and Emmett Toms, Dominion External Affairs Manager. About the Dominion Foundation: The Dominion Foundation is dedicated to improving the physical, social and economic well-being of the communities served by Dominion companies, including Dominion Virginia Power. Dominion and the Foundation support nonprofit causes that meet basic human needs, protect the environment, support education and promote community vitality. For more information about Dominion (NYSE: D), headquartered in Richmond and one of the nation’s largest producers and transporters of energy, visit www.dom.com. About the Blue Ridge Area Food Bank: Founded in 1981, the Blue Ridge Area Food Bank is the largest organization alleviating hunger in western and central Virginia. Headquartered in Verona, VA, the Food Bank serves 25 counties and nine cities through distribution centers in Charlottesville, Lynchburg, Winchester and Verona. The Blue Ridge Area Food Bank distributes more than 24 million pounds of food annually to 114,000 people each month through a network of 224 community partners — food pantries, soup kitchens, shelters, schools, churches and other non-profit groups. The Food Bank is a member of Feeding America, a national food bank association that supports more than 200 food banks across the United States. For more information, visit www.brafb.org.